Halo is the pet food company that is spearheaded by ellen, SO IT MUST BE GOOD! In all seriousness though, I was looking at the ingredients of a few of there dog food recipes and they do have some really good dog food and cat food. The spots stew looks top notch, and they have some really good spots stew for sensitive kitties. The cat food is the only food that does not use rendered chicken parts or chicken meal, in fact, they don't use any chicken. They have potatoes, salmon, trout, tuna and fruits and vegetables, that is better than what I eat! 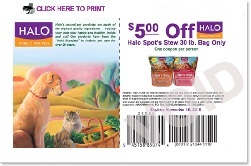 Here are the coupons for the halo dog food (or cat food) Theses are straight from the Halo website, no gimmicks, just savings! Enjoy the savings, and don't forget to look for other great coupon websites. There are a lot of coupon websites out there and you can really save a lot of money!